The fall of the year in British Columbia, Canada is a much-anticipated season for the river angler. This is the time of plenty as rivers through out the province are teaming with life as the Pacific Salmon returns from the ocean to complete their life cycle and propagate their species. British Columbia is blessed with no less than five separate species of Salmon in our waters; Chinook/King, Coho, Sockeye, Chum and Pink Salmon are all available. Through out most of the province the majority of these fish embark on their spawning ritual in the months of September, October and November. 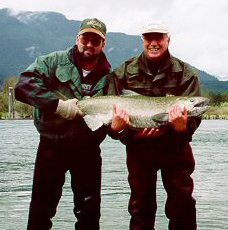 British Columbia is a vast province with many different river-fishing opportunities, it is important to recognize the different types of water conditions and the different attitudes of the fish that live in them. 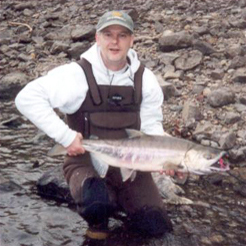 For example Coho Salmon that return to the Skeena River and its tributaries are on average much more aggressive than any of the Coho that return to the Fraser river and its heavily pressured tributaries. There are also certainly many different techniques for catching the "same" fish in different parts of the province, Float fishing, Bottom bouncing, bar fishing, Plug pulling, spin fishing and Jig fishing all have a time and place where they will out produce one another. The other factor in fall fishing for Salmon is the environment in which the fish are pursued, are you fishing a big slow river, a medium sized rocky fast flowing river or a slow moving or still slough or bay? There are many different variables to consider when we venture out this autumn if we want to consistently catch Salmon on our chosen body of water. 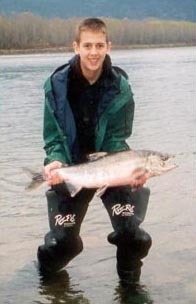 Float fishing is easily the most popular method of fishing for Salmon in southern B.C. I can however personally testify to its effectiveness in the northern Skeena waters as well. This technique is most effective in small to medium large rivers with moderate depths and medium-to-medium fast water speeds. 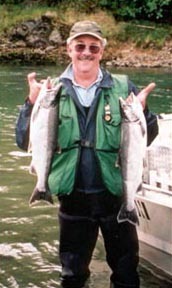 Float fishing is however one of the most technical and challenging methods to learn to catch Salmon consistently. Many anglers fail to pay attention to the little details that make float fishing so effective and thus never experience just how effective it can be. The main reason that float fishing is so effective is that it presents your bait at or near the bottom of the river in a natural manner that gives the fish more time to look at and consider your bait. The rigging is relatively simple, your main line should be between 15 and 20lb test, your float, be it foam, balsa, cork or hi-tech clear plastic is attached right to your main line. Below you're your float, weight consisting of split shot or pencil lead is fixed followed by a barrel swivel. Your float to weight distance should be adjusted to be slightly less then that of the depth of the portion of river that you are fishing. Your leader is then attached to the swivel and is usually between 6 and 15lb test and 20 to 40 inches long depending on river conditions. Your bait or lure is next; this is a topic that is easily open to much debate but I have found that a simple approach is usually best. My favorite float fishing baits can be broken down into four categories, Yarn, Roe, Blades and Jigs. All of these baits are very effective when fished correctly. Yarn is easily the most inexpensive bait and very adaptable in size and color selection. Yarn ties fish well in many water conditions and in water speeds varying from moderate to swift. When I rig my yarn ties I always make sure to have at least two different colors included for contrast and always make sure that they are trimmed into a nice clean egg shaped ball. Roe or Salmon eggs are consistent bait for all species of Salmon. Roe can be fished in a spawn sack or natural, both work well. Many anglers color their roe with the commercial bait cures available on the market this usually improves both the longevity and effectiveness of your bait. Roe works well in virtually all water conditions and locations. Natural baits are not legal in all waters so consult regulations on any body of water you plan on fishing first. Blades are simple spinners made up of a spinner blade a couple of swivels a split ring and a hook. These lures are fished the same way you would fish yarn or roe and can be very effective in moderate to swift water conditions. Blades come in several different styles, sizes and finishes. Blades are a great bait at attracting aggressive fish so there is no need to get carried away with light leaders, as the strikes are usually quite aggressive. Jigs for many anglers are an over looked bait. In the past several seasons I have found more and more applications for this very interesting salmon bait. Jigs as it turns out, fish very well under a float for Salmon. Most of the jigs I have been using vary in size from ? to ? once and have marabou feathers tied to them. Marabou is a feather that is extremely fluffy and literally comes alive under the water. This bait is one that I have found works best in slower waters and can be fished well off the bottom as most fish will come up to get it. Marabou jigs can be made in almost any color imaginable but for whatever reason I have found different shades of pink to be the best. These strange looking baits do take a little getting use to but if you give them a chance you wont be disappointed. 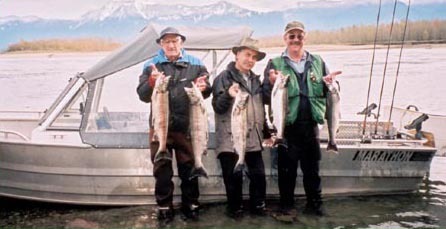 Float fishing is a very versatile and productive technique for many of the different conditions and locations for the Salmon of British Columbia, Canada. Bottom bouncing is and has always been a very effective technique to catch Salmon in B.C. This method is much like float fishing just with out the float. Bottom bouncing is a very good way to cover large runs that hold Salmon but don't have any clear-cut seems or holding lies. Deep holes and runs are also a good place to employ this technique. As the name employs bottom bouncing is just that, letting your bait bounce along the river bottom but in a controlled and precise manner. The Basic rigging is very simple, your main line usually 15 to 20lb test is attached to a swivel, your weight usually pencil lead is then attached to your swivel or line via some surgical tubing. Your leader line usually 8 to 15lb test and 20 to 40 inches in length is attached to the other end of the same swivel and then to your hook at the opposite end. Productive baits include, Roe, yarn ties, Spin n glows, Corkies and artificial rubber baits including Jenson eggs, Gooey bobs and things like that. Bottom bouncing is all about feel so it can also take some time to master and become consistent with as with all Salmon fishing knowing when and were to employ these various techniques is critical. Bar fishing or "plunking" is also a very popular technique for catching Salmon through out this province. 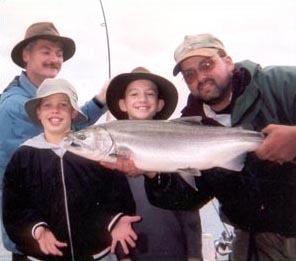 Bar fishing is a laid back approach to Salmon fishing, basically you set your rods and the wait for the fish to bite. Rigging does vary a little depending on where you are fishing. In the slow waters of the lower Fraser river 15 to 20lb test line is attached to a bar rig consisting of two wire spreader bars that each hold a short leader and hook that is then baited usually with roe. On the bottom depending on water speed between 1 and 6 ounces of lead is attached to the end of the rig. The upper Fraser and Skeena rivers use a similar approach to rigging except everything is bigger and heaver to hold in faster waters. Main line is usually between 25 and 40lb test that is either attached to one heavy-duty spreader bar or simply a large 3-way swivel. The bottom of the swivel or spreader bar has a short dropper line to the weight that is usually between 8 and 20 ounces. The middle of the swivel or spreader bar has the leader usually 24 to 40 inches long and 20 to 40lb test running out to the hook. Hooks are usually large 4/0 to 6/0 are standard. In front of the hooks one or two large spin n glows are strung on the line as the lure. Roe can be added to the hook fore extra attraction. Swift water or slow water bar fishing is definitely for the angler who like to put the rod in the holder and pass the day just sitting back waiting and watching for the rod tip to wiggle. 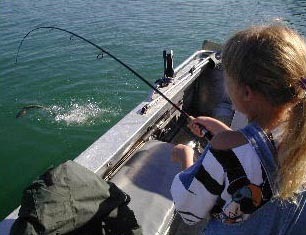 Plug pulling is a technique that is limited to anglers who have boats. This is a great way to fish larger rivers and cover big runs for aggressive fish. Plug pulling has long been popular in northern B.C. but has yet to gain a reel following down in the south coast.Salmon plugs come in many sizes and colors, Wiggle warts and Hotshots are productive and popular. Pulling plugs is basically done by letting out your plug of choice out behind the boat 20 to50 feet or so and then slowly backing down the river. The Salmon down stream get to watch this wiggling lure slowly coming back at them and this often causes an aggressive response from the fish who then attacks! Level wind reels and stout rods between 8 and 10.5 feet long with line between 20 and 30lb test are the norm. Spin fishing and jig fishing for Salmon fall into the same category. Whether you are fishing lures (spinners or spoons) or Jigs you will be casting and retrieving all day long. Spinners and spoons have long been a favorite among many river fishermen and rightly so, this hardware produces fish! Spinners and spoons are effective in fast water as well as water that is completely still. Spinners offer a very flashy and slightly slower presentation. Spoons however have a very seductive fish like wobble. Both lures are available wide variety of sizes, finishes, textures, shapes and colors. Some of the more productive and popular lures include kitamats, Kohos, Ironheads, Crocs, Silvexs and Colorado's. Fishing spoons and spinners basically consists of casting and retrieving your lure as close the bottom as possible. Usually the slowest retrieve possible is best as most Salmon will follow and chase lures for quite some distance before striking. Jigs are a relatively new bait for many anglers in southern B.C. but our northern friends who fish the Skeena and its tributaries have been using these with great success for years. Earlier I discussed fishing jigs under a float and this works great but jigs are also very effective when cast and then retrieved while jigging the rod tip up and down about 1 to 2 feet or so. This is also one bait that you don't want to fish close to the bottom or else kiss it good-bye because jigs snag big time. Thankfully jigs are more productive when fished in the top half of the water column and in slow or still water. It is very exciting to watch when as many as half a dozen fish chase these lures right to your rod tip before one finally takes it! Jigs sizes in ? to ? once tied in various shades of pink marabou seem to work best. River fishing techniques obviously vary greatly depending on the situation and so does the gear needed to fish them. Long rods, short rods, level wind reels, spinning reels and center pins, where does it end? Well it doesn't really as there is just no such thing as a fishing rod that will do everything. Anglers do need to have a couple of options as far as their gear is concerned if they plan on fishing several different locations and utilize more than one style or technique. Float fishing requires long rods between 9 and 13 feet usually using a levelwind/baitcasting style reel. Many anglers also employ center pin style reels as well. These rod and reel combos are necessary to properly control you line while making a drift. The ability to keep your line off the water while precisely feeding line off the reel is crucial to consistent float fishing success. Bottom bouncing also requires the ability to have good line control. Rods ranging in lengths from 8.6 to 10.6 are most common and level wind reels are preferred but spinning reels will get you by if necessary. Bar fishing or plunking is a little more open to rod and reel selection. Rods ranging in length from 9 to 12 feet with either spinning or level winds are appropriate depending on preference. A good heavy-duty rod holder is also a must as more than just a few rods have been dragged into the river by large fish, the old tree branch will not cut it here. Spin fishing and jig fishing are similar, rods varying in lengths from 7 to 10.5 feet with level winds or spinning reels will work just fine in most situations. Jig fishing however is easier with rods under 8ft accompanied with a spinning reel. As river fishing becomes more and more popular the rivers and streams that we fish we obviously become busier. Anglers need to accept this and be tolerant of one another. Crowding is inevitable in certain spots, so if you go their be prepared to deal with it. Basic respect to all by all is a must. When fishing is good it bring out all types of anglers some experienced and some not, a few kind words from those in the know to some one who is just starting out can go a long way to an improved day of fishing for all concerned. Snagging on purpose is Illegal and unethical and any person seen doing this should be reported immediately. However when Salmon fishing in the fall it is more likely than not that you will foul hook a few fish by mistake. Many times there are so many fish concentrated in a small area that this will happed inadvertently. Fish that are foul hooked by accident must still be released immediately. It is not legal to keep a foul hooked fish for any reason and all must be released unharmed. When is a salmon to colored to keep? 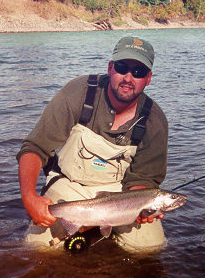 River anglers frequently refer to the fish as clean, chrome, dark or dirty. These terms refer to the condition of the Salmon. In the autumn as Salmon enter their home rivers they arrive bright silver, fat and healthy. Salmon may spend anywhere from a couple of weeks to well over a month in fresh water and as the do so they start to change from a silver sleek fish to a mature spawning adult. As this happens the quality of there flesh deteriorates considerably. Obviously bright silver fish are preferred for retention, fish that are slightly colored are usually ok, but this is a judgment call that has to be made by the angler. I have heard many anglers justify keeping darker fish saying that they will smoke it anyway and it won't matter? not! Keep in mind that if you smoke garbage you will end up with smoked garbage. A little time and experience will help you make good judgment calls regarding this but keep in mind if it doesn't look fresh it isn't and it is probably best released back into river. River fishing for Salmon is an exciting sport. Anglers who are versatile and have an open mined will do well. There are just so many options available to us here in British Columbia, Canada. If you haven't yet experienced the fishing in September, October and November then you are just plain missing out. Don't be intimidated by the vast diversity that this fishery has to offer. Look at this as a challenge and an education process, after all no one person started as an expert. I am always amazed at all the new little things and details there are to learn every season. Remember that the best place to start is always at the beginning!